The Snoqualmie Pass ski area, also known as the Summit at Snoqualmie is located in the heart of the Washington Cascades, 52 miles east of the city of Seattle. It is Washington State's largest ski area. Its proximity to Seattle, as well as its weeknight skiing make the Snoqualmie Pass ski area a popular one for after-work play recreation for Washington's city dwellers. The Alpental ski area is situated on Denny Mountain, which is named after Arthur A. Denny, the founder of Seattle. Denny made iron ore mining claims in the area in 1869. Almost a century later, a man named Bob Mickelson put together a group of friends and bought options on the mining claims in the area, with goals of turning it into a ski resort. They engaged the services of extreme skiing filmmaker Warren Miller to make a promotional film about the area. The resort opened in the 1967-68 season with three chairlifts and five rope tows. It was sold to an Alaska resort management company called Westours in 1977 and to Booth Creek Ski Holdings in 1998. In 2007, Alpental, as well the three other Snoqualmie areas were sold to CNL Income Properties, Inc. The areas are currently managed by Boyne USA Resorts, who also manage Boyne Highlands and Boyne Mountain Ski Resorts in North Michigan.Alpental is the only Snoqualmie ski area noted for its challenging terrain. Its base elevation is at 3,140 feet and its summit is at 5,420 feet. The resort has 302 acres of lift-serviced terrain, and 825 acres suitable for backcountry skiing. It boasts 75 percent advanced terrain, 20 percent intermediate and only five percent beginner terrain. There is one high-spread quad, three double chairs and one rope tow. Summit West or Snoqualmie is the learning and family skiing area of Snoqualmie. In 1933, it was actually a municipal park, owned by the city of Seattle. In 1940, the local townspeople expressed the opinion that Seattle was too far away to be controlling their park. The area was sold to Ski Lifts Inc., who added rope tows to the park, and gave it the name Snoqualmie Pass ski area. Like the other Snoqualmie ski areas, Summit West is now owned by CNL Income Properties, Inc. and managed by Boyne. The area has a base elevation of 3,000 feet. Its summit is at 3,765 feet. Two quad chairs, two triple chairs, two double chairs and one rope tow service 197 acres of terrain, which is divided into 20 percent beginner, 55 percent intermediate and 25 percent advanced. Its varied terrain, as well as its large terrain park and half pipe, make Summit Central, also known as Ski Acres the most popular resort of the four Snoqualmie areas. It is also the most crowded. The area was opened in 1948, and was acquired by Ski Lifts Inc. in 1980. 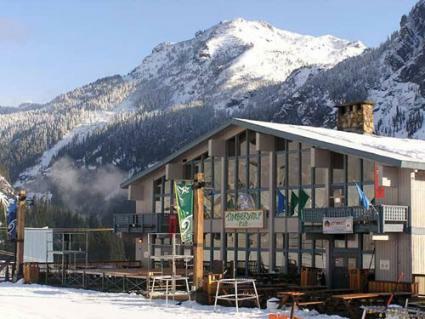 It is currently under the same ownership and management as the other Snoqualmie ski areas. Summit Central rests at a base of 2,840 feet. Its summit is at 3,865.Two high-speed quad chairs, one triple chair, four double chairs, two magic carpets and one handle tow service 350 acres of terrain, which is divided into 15 percent beginner terrain, 60 percent intermediate and 25 percent advanced terrain. In addition to its intermediate and advanced runs and glade skiing, Summit east is also a popular cross-country skiing and snowshoe venue. It first opened in 1959, and was bought by Pac West in 1980. Summit East was one of the first ski areas to allow snowboarding. Its base is at 2,610 feet and its summit is at 3,710 feet. The resort has one double chair, which services 15 percent beginner terrain, 45 percent intermediate terrain and 40 percent advanced terrain. Summit East is only open on weekends.